When something moves, we pay closer attention to it. But how stagnant is your business? A couple of weeks ago we had a fun post on our Facebook page with those air filled stick men they often have on top of a Godfreys store denoting a ‘special event’ (yes one of many). But it doesn’t have a sign saying sale, all we know is that it signifies something going on. Four years ago I was staying at the Sofitel Brisbane. I walked in to the room and a song was playing on the TV – “Life is magnifique”. I actually left the song on the TV for much of my stay. I loved it. It fit perfectly with the ambiance and brand values of Sofitel which is as a French luxury hotel where “life is magnifique”. I tried to get the song, but found it was recorded specifically for Sofitel and wasn’t publicly available. The other day I stumbled across a video clip of it, and I’ve played it over and over again. Together with my background as an event manager it has always been important for me to understand how, during the customer experience, we reach out to all of the senses. Now it’s not just about having the right music to connect, it’s about having ‘some’ music. I’ve been in to stores where there is NO music. It feels stark. It feels uncomfortable to talk in. Any sudden sound from dropping a plate too heavily to having the phone ring can instantly startle people. No one likes to feel like they’re the only noise in the room. Unless you’re a library, you’ll at least want some ambient sound (it’s not enough to really notice, but it takes the chill off the silence). You might have it at a level where it’s noticeable but doesn’t interrupt conversation, then of course if you’re an entertainment venue you’ll known where your sound levels need to be at. We all have iTunes. Make up a play list that suits the right times of the day, and fits with the values of your business. As yourself, how do I want my clients to feel? Think of your business as a movie scene…you want the right mood to set the scene. You may have areas of the customer experience where you want your audio levels to be quieter (like service areas) and louder (like on the street to get the vibe). But I’ve seen some businesses that are too loud in one area and almost silent in the next. Don’t use a radio station if your competitors advertise on it flat out. The last thing you want to do when you’re trying to immerse customers in your brand is to have your competitors name bouncing in! I’ve stayed in a lot of different hotels, but as soon as I heard the Sofitel song again, I immediately remembered the time I had in Brisbane, what the room looked like, the lounge on the top floor, the gym, the restaurant for breakfast. All of that experience was aligned too – Magic and magnifique. The sensory experience of my time at Sofitel came flooding back to me. So understand that music takes people back to memories so make sure the experience they remember is good enough to have them raving about you. Your target customer is NOT everyone! Have you got one (or several) of those customers that just whinge all the time? Do you doubt that your marketing is generating as much income as it costs you? Then chances are, you haven’t determined your ideal customer. Stop thinking about what you like to tell everyone and start thinking about what your best customers care about. 1. Effective businesses attract customers they don’t chase them. Stop throwing stacks of money behind blanket advertising hoping to grab customers and tempt them to come in. Know your ideal customer so you know where they are and what they’re doing. Then the aim is to become part of their lives. There’s no use throwing TV ads on if your ideal customer loves outdoor adventure and is a dedicated watcher of the ad-free ABC. 2. You’ll have more than one ‘ideal customer’ type. 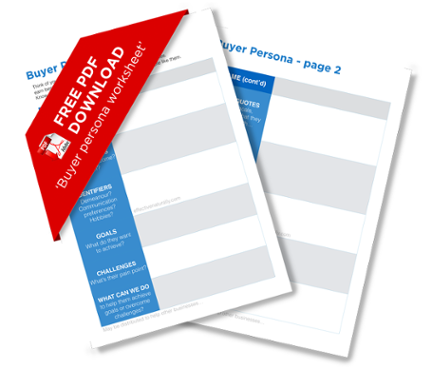 We often create buyer personas for one or two primary customer types. Then you might have a few other secondary customer types but my advice is to get really good at knowing your primary ‘ideal customer’ first. You want to create key marketing messages that hold true and authentic value. The trick is not to rely on blanket advertising to the masses otherwise you’ll confuse the market with mixed messages. Instead you’ll need to ensure you target those messages to where only those people see them. This is why digital and social channels are so beneficial. You can easily segment the ideal message to the ideal target customer. 3. It goes beyond how old they are, where they live and what’s between their legs. Demographics are all about the measurable aspects of a person: Gender, Age, Income. The thing is today’s world is full of individuals. People don’t hang out in age groups anywhere near as often as they used to. People are much more diverse than that now. We knew that these guys (aka humans) were probably the first generation to have disposable wealth. They’re probably partners of FIFO workers or trades people and may not be quite as turned on by refinement as they are by features. They’d likely drive a top of the line Holden rather than a Mercedes. They’d more likely live in a suburb where the houses are new and big, rather than a leafy classic street of traditional homes. So why was knowing all this so important? Because the stock was bought with them in mind. They liked bigger things that were shiny, not the things that were handcrafted. In the same way, any advertisements that you use would include the visuals and the messages that would appeal to this buyer. Don’t take it personally (many business people do). Why don’t all those people want my product? It’s either because they don’t know yet why they need it (and you’ll need to focus on nurturing that relationship) or simply because they’ll never care about your product. It simply doesn’t fit in to their life, and you need to be Ok with that. 5. Stay focused, say no, hold your nerve. Steve Jobs was well known for his ability to say no and stay focused on the project at hand. It’s that same focus that you need to have on matching what your business does best, with the buyers that want it most. This will mean that you’ll get offers for advertising that sound like they’ll reach lots of people, but if they don’t reach the RIGHT people, you should feel comfortable to say no. With the focus on who you do want, and who will likely want you, you’ll notice that those customers who are problematic eventually aren’t there anymore, replaced with more of those that are easier to serve. So now that we’ve determined your target audience isn’t “everyone”, I want to give you something that will help you ‘profile’ your ideal customer/s. Here’s a simple chart to get you thinking about what makes your ideal customer tick. Click on the image below, or download it here.